One thing I love so much about birding is that it is an activity that you can easily share with other people. Its also an easy hobby to get interested in and slightly addicted to! Over the last year, I've tried to introduce my parents to birding a little more, whether it is through pictures I bring home or through pointing out things while out with them. 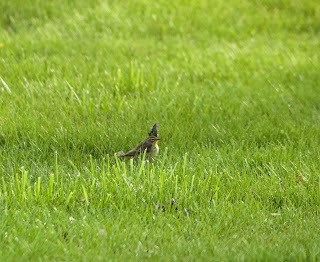 My mom often will spot birds in the yard and has been really good at noticing things that "aren't like the others"! 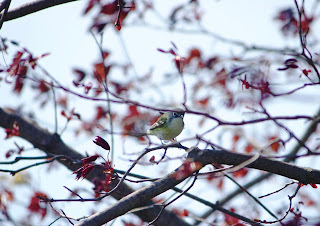 In fact, the other week she managed to spot a Blue-headed Vireo in our backyard tree. 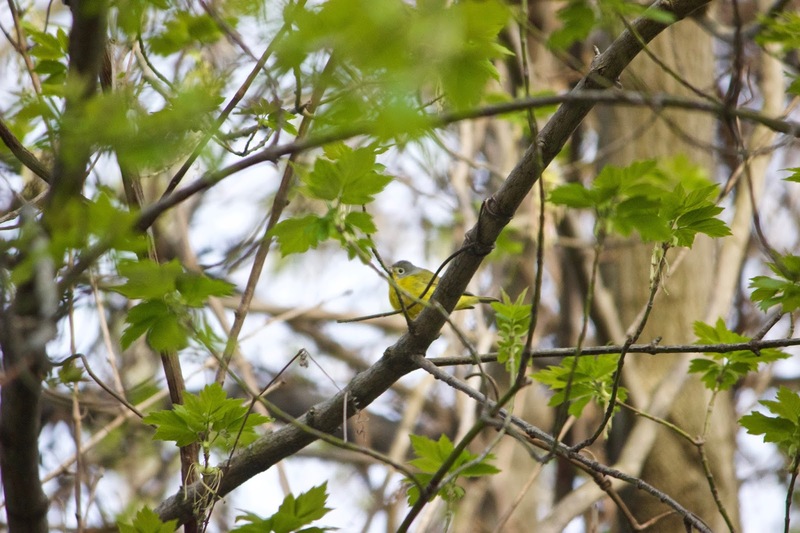 My dad, who's becoming a bit of a lister, set his binoculars on it and gave me the description, but his "grey head with a yellow body and white eye ring" just lead me in circles around a Nashville Warbler until I was actually home to see it. My parents got me a lifer! 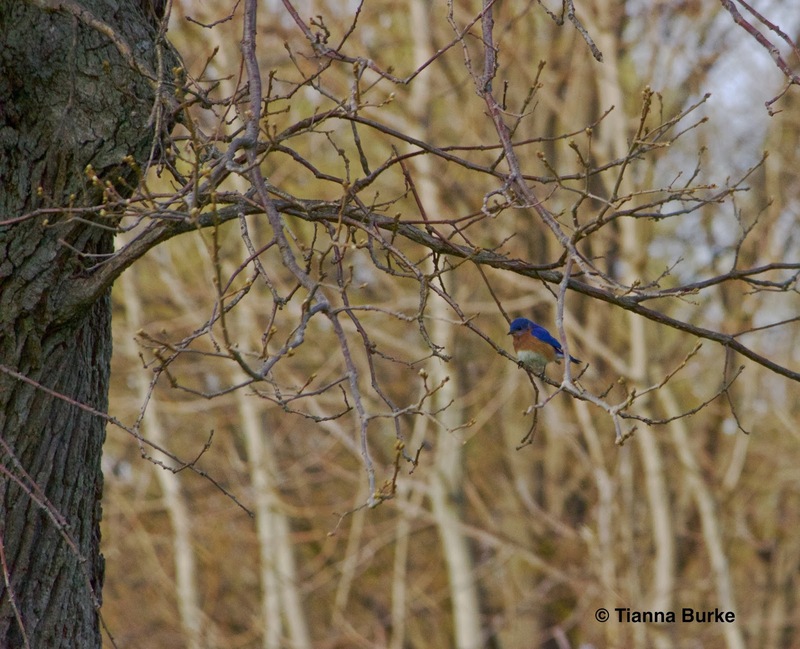 Last week I took my Dad out birding at Rondeau Provincial Park. I have been home in Chatham for a little over a week, and wanted to take him out for a night of some birdy fun, especially since it is migration and he hasn't seen many of the fan-favourite colourful warblers! We walked into the park, so while we were not able to make it too far before sunset, we did make it to the marsh trail and back to the gate. We saw a total of 51 species just within this area! 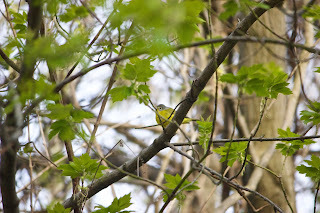 Trees were full of warblers that evening, especially Yellow Warblers. We were able to spot Nashville, Parula, Yellow-rumped, Redstart, Black-and-white and Blackburnian all within a short distance from the front gate. All of these were lifers for my father! We also we not able to walk anywhere without hearing Baltimore Orioles...they were everywhere! 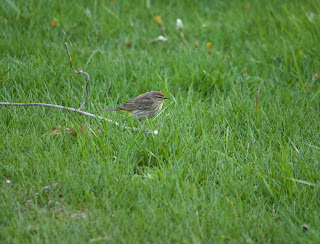 Closer to the Park Store, we noticed a few birds hopping around in the grass. 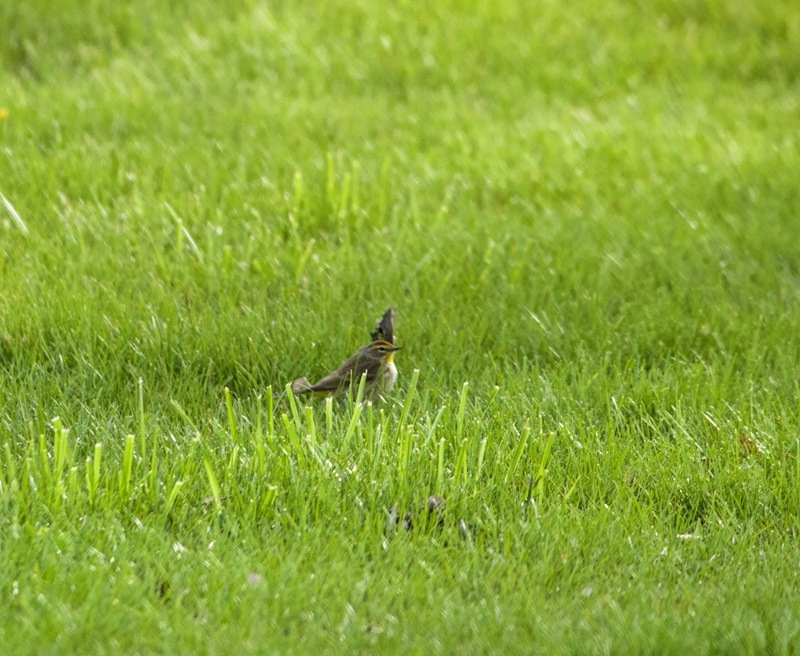 There were a variety of sparrows (Chipping, White-crowned, White-throated), as well as some warblers! 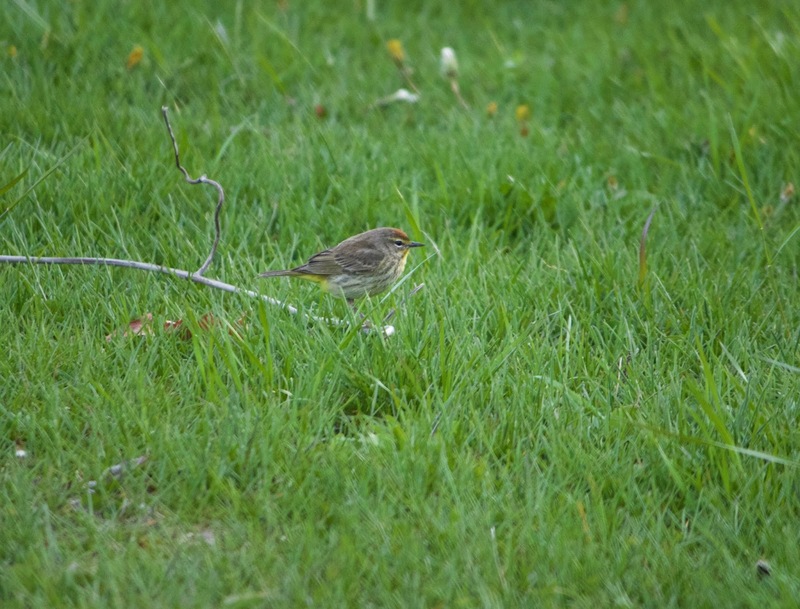 A few Yellow Warblers were feeding on some of the insects they could find in the grass, and then amongst them was my very first Palm Warbler (109th species of the year)! Have you ever noticed that you can see a bird for the first time (even after a year of searching for one) and then suddenly you see them, quite literally, everywhere? This was definitely my experience with Palm Warblers. As soon as I saw my first one on the Park Store lawn, suddenly there were about 15 more. 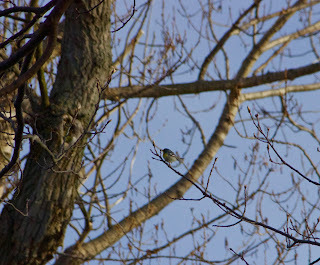 Then the next day at Pelee, I saw a couple dozen more! It makes me wonder how I never noticed them before. We then began chatting with a park visitor from Whitby who had seen a pair of Red-breasted Mergansers on the bay. I began showing him the different birds that were around us and giving him their IDs, when out of my eye I spotted something blue. 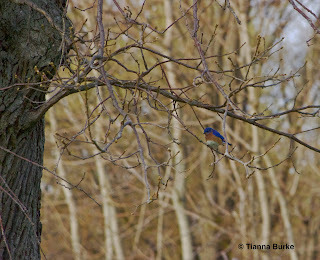 It was a Eastern Bluebird!! Another first for my Dad and it definitely made this visiting couple very happy as well! This little guy flew from branch to brach giving us some amazing views. On our walk out of the park we were stuck with 49 species. I was pretty determined to get us an even 50, however with the sun setting and it getting dark it seemed like it would be rather difficult to do! As we continued to walk, my father and I talked about all the different birds we had seen, what ones I thought we missed and what could potentially be our number 50. He was astonished how within about two hours we had seen that many, especially since we had barely made it into the park. Then, a few steps before the gate, we heard our #50. "Peeeeeent". An American Woodcock. Driving home to Chatham, we took the highway through Blenheim, Ontario. As we drove down the road my dad suddenly came to a screeching stop and pulled into a gas station as he excitedly started screaming "OHHHHHH MAN THERES AN OWL!". 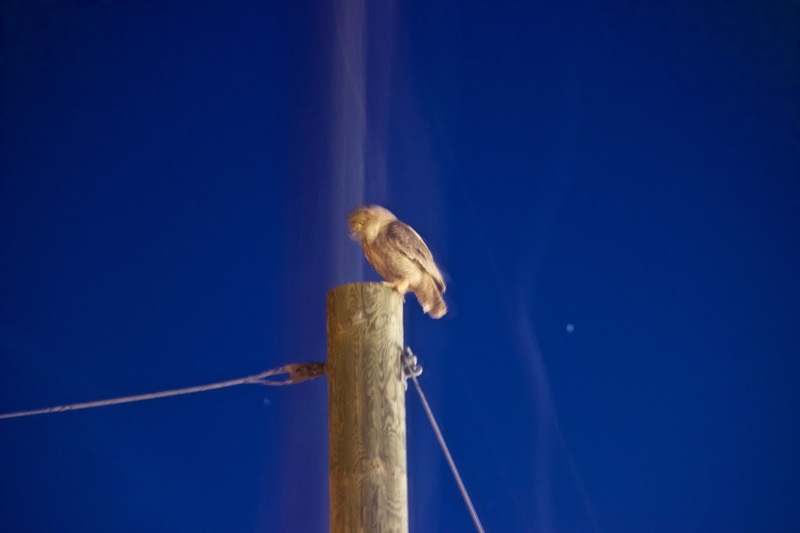 Sure enough, on the top of a telephone pole, there was a Great-horned Owl. It swooped and grabbed a dead squirrel before flying off into the park across the street. Of course my camera settings were not at all prepped for this (not that I am great at night photos to begin with! ), so my photo turned out...a little eerie! Hope everyone is having a great migratory bird day and enjoying the greatness of spring migration!!! I am a few days behind on my blogging, so I will be trying my best to catch up.